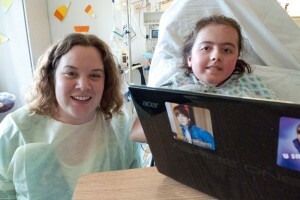 I am the music therapist at Akron Children’s Hospital in Akron, Ohio, and I’m writing to see if Justin Bieber would do us a huge favor by dropping by to visit Megan Parker. Megan is a 13 year old girl and patient that I’ve been working with since she has been hospitalized in our pediatric intensive care unit (PICU). Megan has end-stage Ulrich’s progressive muscular dystrophy and was hospitalized over 2 months ago with respiratory failure.